LAUSANNE, Switzerland, February 19, 2012 (ENS) – The proliferation of debris orbiting the Earth – abandoned satellites, spent rocket stages, bits of broken spacecraft and fragments from collisions – is a pressing problem for spacecraft that can generate huge costs. To solve this problem, the Swiss Space Center is launching CleanSpace One, a project to develop and build the first of a family of “janitor satellites” designed to clean up space debris. 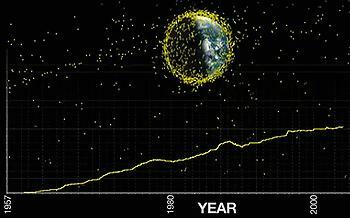 NASA tracks at least 16,000 of these debris objects larger than 10 cm in diameter. When an operational spacecraft collides with one of them, serious, costly damage can result; often the satellite is complete destroyed. The collision itself then generates thousands more fragments, worsening the problem. This is what happened on February 10, 2009, when the U.S. satellite Iridium-33 exploded upon impact with the abandoned Russian satellite Cosmos-2251. “It has become essential to be aware of the existence of this debris and the risks that are run by its proliferation,” says Claude Nicollier, astronaut and professor at the École polytechnique fédérale de Lausanne, EPFL. 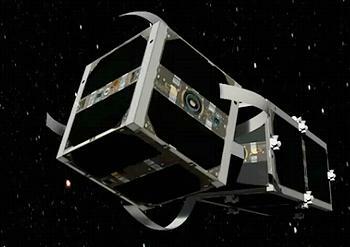 Announcing the CleanSpace One project on Wednesday, developers said they have chosen a symbolic target for the initial launch – either Switzerland’s first orbiting object, the Swisscube picosatellite which was put in orbit in 2009, or its cousin TIsat, launched in July 2010. The cleanup satellite has three major challenges to overcome, each of which will require the development of new technology. After launch, the janitor satellite will have to adjust its trajectory to match its target’s orbital plane. To do this, it could use a new kind of ultra-compact motor designed for space applications that is being developed in EPFL laboratories. When the cleanup satellite gets within range of its target, which will be traveling at 28,000 km/h at an altitude of 630-750 km, CleanSpace One will grab and stabilize it – a “dicey” mission at these high speeds, particularly if the satellite is rotating, says Nicollier. To accomplish the task, scientists are planning a gripping mechanism inspired by a plant or animal example. Just before reaching its target, CleanSpace One unfolds its bio-inspired gripping mechanism. Finally, once it has coupled with the satellite, CleanSpace One will “de-orbit” the unwanted satellite by heading back into the Earth’s atmosphere, where the two satellites will burn upon re-entry. Although its first model is destined to be destroyed, the CleanSpace One will not be a one-shot deal. “We want to offer and sell a whole family of ready-made systems, designed as sustainably as possible, that are able to de-orbit several different kinds of satellites,” explains Swiss Space Center Director Volker Gass. The design and construction of CleanSpace One, as well as its maiden space voyage, will cost about 10 million Swiss francs. Gass says that depending on the funding and industrial partners, the first voyage could take place within three to five years. Last year the Swiss Re insurance company published a study showing that every year there is a nearly one in 10,000 chance that a 10 square meter satellite traveling in a Sun-synchronous orbit will collide with a piece of space debris larger than one centimeter. The financial consequences of these collisions are enormous, particularly for insurance companies involved in the space sector. To insure existing satellites, it costs a sum currently estimated at US$20 billion. 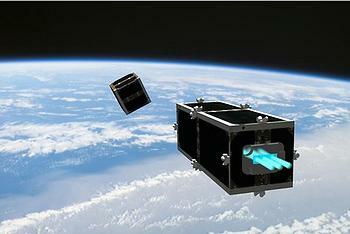 Swiss scientists are not alone in attempting to clean up space debris. South Carolina-based Star Technology and Research has received $1.9 million from NASA to work on a ElectroDynamic Debris Eliminator, which would capture orbiting pieces of junk with a net. The German Aerospace Center also is working on a satellite that would clear outer space of orbiting debris.